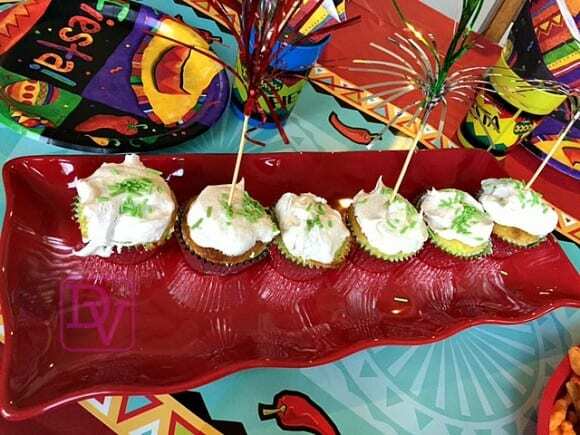 After you have had a few margaritas you might be craving something sweet and these easy to make Cinco De Mayo Cupcakes are just what you are craving. These fun little holidays like Cinco De Mayo provide an opportunity to get creative, without have to delve full throttle into a homemade treat. There is nothing more fun than a Cinco de Mayo party as the foods are fun, and happen only one time per year. Preparing the Cinco de Mayo party requires a few good recipes and some great food in order to have a really grand celebration. I have found however that it does not take a lot of effort to prepare a party with food that is great tasting, however you just have to be a little bit inventive with products that are already out there. I was in need of an easy-to-create cupcake that my family would eat, and delight on, however I was very short on time. Necessity is the mother of invention as they say and I opened my pantry and decided to take two tastes that definitely rivet the Cinco De Mayo flair and combine them. This is my recipe for Easy To Make Cinco de Mayo cupcakes with a great icing as I Lavishly live food out loud! Don’t get too excited because I am not teaching you how to make cupcakes from scratch, but I am going to share a box of heaven with you that mixes well with the Cinco De Mayo theme. I also want to preface that I am not preferential to brand, so if you find a different brand use it, this is simply what I had in my pantry(on hand) so I used this brand, there are others out brands out there. There is a great cake mix out there it is called a Key Lime cake mix. Simply by this mix prepare as instructions on the box, and place into cupcake wrappers. Cupcake wrappers make or break the presentation of a cupcake, find a good one and your cupcakes looks great, use a lame one and well you have a lame cupcake. Turn up the decor just a bit and invest in those foil ones if you don’t go to a specialty store to find cool cupcake wrappers! The pretty wrappers makes the cupcakes look quite festive and then when you add fancy foil picks you really get a great festive look! After creating the cupcakes, and allowing them to cool- I whipped up a batch of my famous icing but wait till you see how easy it is to make this icing. I used to cringe when I would buy the already made icing, as it was far too sweet as well as far too thick to stir! I also never like how it looked the top the cupcake. What I have found is revolutionary and something that many of us keep in our freezer is already. Grab that frozen whipped topping (no matter what brand) When defrosted and you add-in things that you like to flavor it or give it color, you will kick yourself for not having used this before! I simply allow the Whipped Topping to come to room temperature while defrosting in the refrigerator. After it is defrosted I place it in a bowl, and I added my own personal cinnamon sugar mixture that I keep in a container (2 parts cinnamon, 1 part sugar). Deck out those pretty cupcakes with foil picks to give them even more ‘fiesta power’ and then enjoy. Making the cupcakes took about 45 minutes from start to finish and the cake batter was minimal prep. The baking allowed me to get other things done, and then as they cooled, I made sure to gather all of the items for the topping, cinnamon, picks, sprinkles etc. Do note these should be refrigerated if they are all not eaten during your celebration as this is a whipped topping and needs refrigeration. 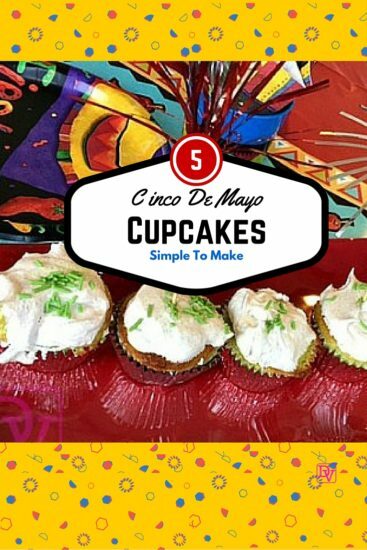 Enjoy making this easy to make Cinco De Mayo Cupcakes and lavishly live the Cinco De Mayo Out loud! Fiesta! Need some Cinco De Mayo Party Planning Inspiration? You are so right — after I have some margaritas, cupcakes are amazing! These little Cinco de Mayo cupcakes look great! How cute and fun idea! I’ve never had key lime cakes/cupcakes before. I would love to try. Thanks for sharing! thanks for the step by step! guess i can still do this and not too late for the occasion! My goodness, these cupcakes are looking absolutely delicious & it looks so easy to prepare as well. A wonderful treat for Cinco de Mayo & everyone around is going to love them so much. Happy Cinco De Mayo! Those cupcakes look fantastic! Key lime is my absolute favorite flavor on pies, cakes, etc. I would definitely love trying to make this! Yum! Happy Cinco de Mayo! Yummy cupcakes are always a hit with the kids. You had me at key lime. These sound delicious! We definitely need to do something fun to celebrate! Wow Key Lime Pie and Cinco de mayo…never thought of using one to create the otehr awesome share! Awesome cupcakes. Love to make some of them too. Thanks for sharing some ideas. These cupcakes look so delicious and easy to make. I will have to get the ingredients i need to make them this weekend. The cupcakes look great! Thanks for sharing the recipe! Czjai Reyes-Ocampo recently posted..Sneak Peek | SkinFood x Eva Armisen. This is a really fun post. 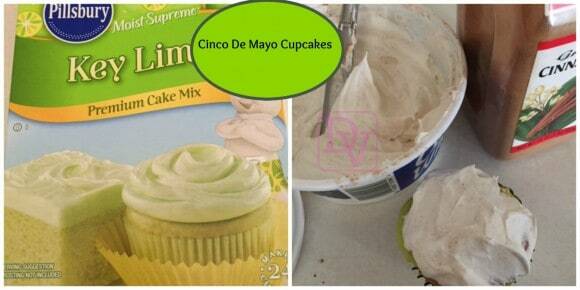 I had no idea Key Lime Cake mix can be used to make such a fun-looking cupcake for Cinco De Mayo! Such a creative cupcake. perfect for any occasions. I’m so glad that you share your recipe. These look delicious. And the whole family are fans of key lime, so it would be a success in our family! I love the fun flavors that Pillsbury has for cupcakes! I tried the key lime recently and loved it…but I love the flavor of lime. These do make fun treats for Cinco de Mayo! Cinco de Mayo is tomorrow?! Wow, that snuck up on me! Those look like a great sweet treat for the occasion! These Cinco De Mayo Cupcakes look so good. I would love to try your idea of the key lime cake mix topped with the cinnamon sugar whipped cream. This indeed would be an interesting combination of flavors. Thanks for sharing these ideas. I love key lime pie so I know that I would love these cupcakes. Such a cute idea! These look really delicious and I love the kick that is added to them. These are easy to make indeed! I love the flavor as well. Key Lime is one of my favorites and I am totally all about trying this recipe! I love these! We are having a Cinco De Mayo party and I think these would be perfect! These are super cute and look very simple, plus I love Key Lime! It’s a great idea to make for a Cinco de Mayo party! Oh these are the best! I love key lime! I won’t be able to bake on the 5th but these might work for another holiday! These sound really tasty. They would be perfect for a cinco de mayo party! I love the idea of key lime cupcakes for Cinco De Mayo! Since it is technically my stop smoking day, we have an extra reason to celebrate. I had no idea that they had Keylime cupcakes that I could make. Keylime pie is probably my favorite kind of pie. I guess for Cinco de Mayo coming up it’s a good idea to try it. What a fun idea for Cinco de Mayo! I think I will add these to my party table now! Thanks so much! wow these cupcakes looks so delicious … I love cupcakes and always enjoy trying out new recepies. I love the flavor of key lime. I think these would make a perfect sweet addition to a fun day of margarita indulgence. Cindy Ingalls recently posted..Too Faced Sweet Peach Eye Shadow Collection! Oh these look yummy and sound easy to make!! I will have to make these for Thursday! Those sound delicious! You know, I think this might be the first time I’ve ever seen a post about Cinco de Mayo cupcakes. I love sweets period. These look awesome! I will have to make some now for my family! Great Job!! Love those festive cupcakes! They sound super yummy, too.